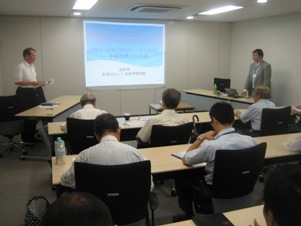 The 6th JRRN River Environment Mini Lecture was held on Wednesday, September 8, 2010. First, the lecturer introduced the latest situation of damage caused by floods and droughts in China, using pictures. In addition, he outlined water resource management in China, explained flood and drought control in detail, and measures for water quality; he also explained the future direction and ideas of the Chinese government’s water resource management policy. In the exchange of opinions after the lecture, participants asked questions about measures for water environments, dam control in China, and technological transfer from Japan.